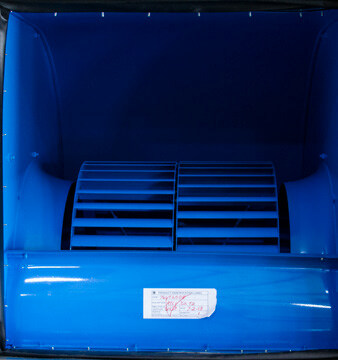 Evaporative coolers provide cool air by forcing hot dry air over a wetted pad. The water in the pad evaporates, removing heat from the air while adding moisture. Although the concept has been used in residential “swamp” coolers in the Southwest for decades, technology advances have made evaporative cooling a viable alternative to conventional cooling in commercial buildings and in other areas of the country. 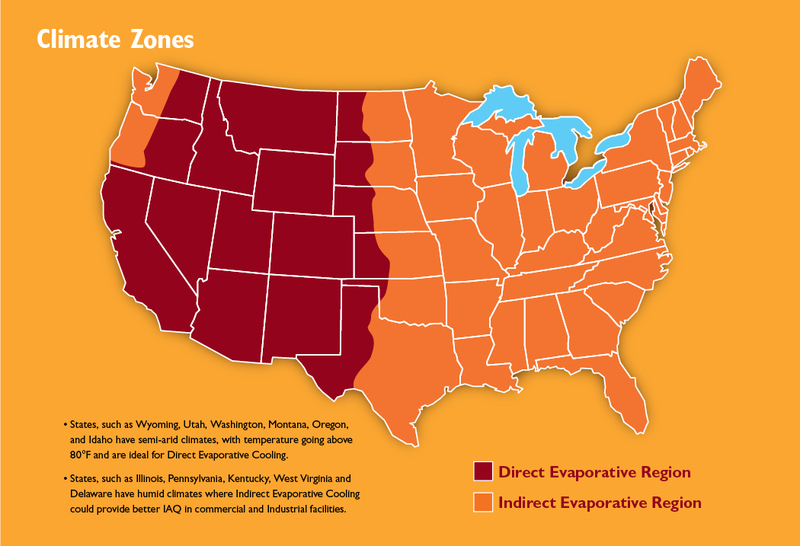 Manufacturers have begun to offer two-stage (“indirect-direct”) evaporative coolers that offer greater cooling effectiveness, extending the geographic range where evaporative cooling can be used. where TDB is the outdoor dry-bulb temperature, TWB is the outdoor wet-bulb temperature and SAT is the supply air temperature leaving the evaporative cooler. The thickness of the media and air velocity contribute to the effectiveness. 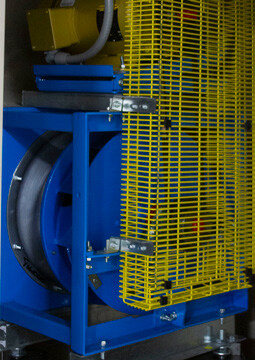 More advanced systems use a rigid medium 8 to 12 inches thick and have an effectiveness of 80% to 90%. Direct evaporative cooling systems are suitable for hot and dry climates where the design wet-bulb temperature is 68°F or lower. In other climates, outdoor humidity levels are too high to allow for sufficient cooling. Indirect evaporative cooling uses an air to air heat exchanger to remove heat from the primary air stream without adding moisture. Hot dry outside air is passed through a series of horizontal tubes that are wetted on the outside. A secondary air stream blows over the outside of the coils and exhausts the warm, moist air to the outdoors. The outside air is cooled without adding moisture as it passes through the tubes. Indirect evaporative cooling typically has an effectiveness of 75%. While the greater number of air passes increases the pressure drop and the required fan power, the high effectiveness extends the geographic range where the indirect evaporative cooler can fully meet the cooling demand. Indirect cooling is often paired with a second direct evaporative cooling stage, to cool the supply air further while adding some moisture to the supply air. 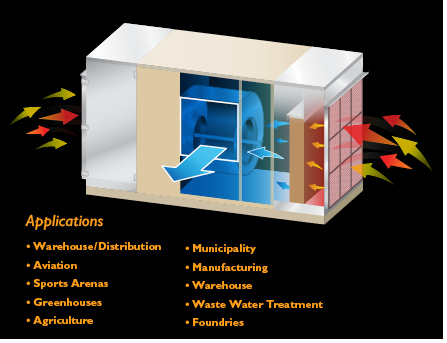 Such two-stage systems (referred to as indirect-direct or IDEC systems) can meet the entire cooling load for many buildings in arid to semi-arid climates. IDEC systems provide cooler supply air at a lower relative humidity than direct evaporative coolers. The first indirect stage cools the supply air without increasing humidity. Since the air is cooled, it has a reduced capacity to hold moisture. The air is then passed through a direct stage, which cools the air further while adding moisture. IDEC systems typically have an effectiveness of 100% to 115%, cooling the air to a temperature slightly below the outdoor air wet-bulb temperature (see sidebar). For commercial systems, indirect-direct systems are often coupled with a conventional DX cooling stage to meet cooling demand during hot and humid outdoor conditions (when outdoor air dry-bulb temperatures exceed 70°F). Since the systems use 100% outside air for cooling, they can also be paired with heat recovery to capture some of the energy that is lost in the exhaust air stream and reduce the ventilation cooling load. IDEC systems used in arid climates (with a design wetbulb temperature of 66°F or lower) can have power consumption as low as 0.22 kW/ton, much lower than compressor-based cooling which can have power consumption on the order of 1 kW/ton. However, in more humid climates indirect-direct systems have less power reduction and energy savings. 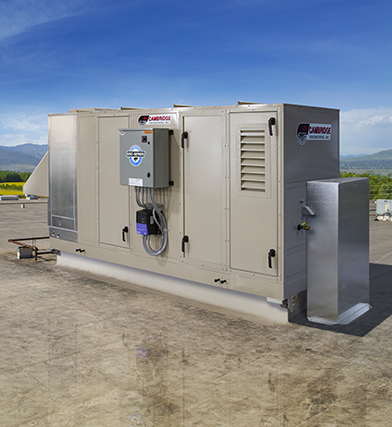 Advanced features on evaporative coolers recently introduced to the market include variable air volume control. 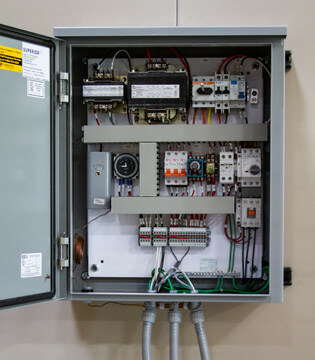 Some units use variable-speed drives, or two-speed or electrically commutated motors for smaller units, to control the space temperature to the desired setpoint. 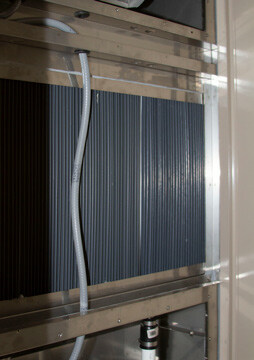 Lower air velocity increases heat transfer effectiveness and significantly reduces system fan power. 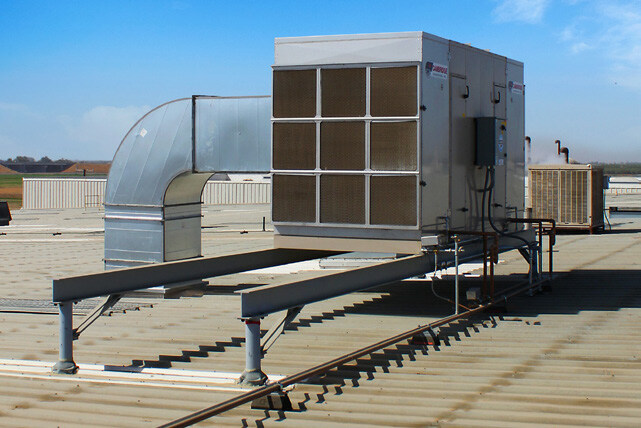 An advanced feature not commonly available on evaporative coolers would include the use of sensors to monitor system performance. 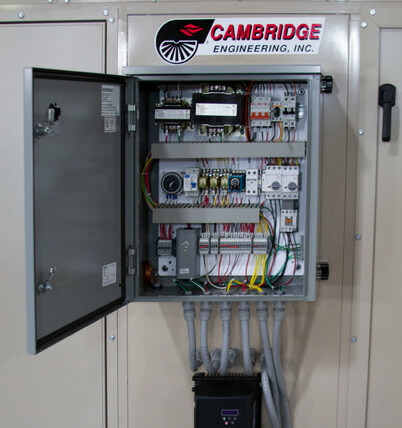 Temperature and humidity measurements would allow for an estimate of system effectiveness. Static pressure gauges that measure pressure drop across the media can also be used to determine when maintenance of the media is required. Due to the higher air temperatures than traditional air conditioning systems, much more air must be used to provide the necessary cooling. As it is generally 100% outside air, provisions must be made for venting the air to the outside without requiring the opening of windows. With residential applications, vents installed in the ceiling (known as an “up duct”) are designed to open when the home is positively pressurized. Sufficient attic ventilation must be provided to then exhaust the ventilation air to the outside. 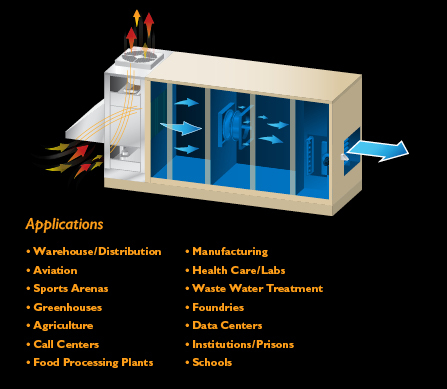 Evaporative cooling systems have a number of benefits. 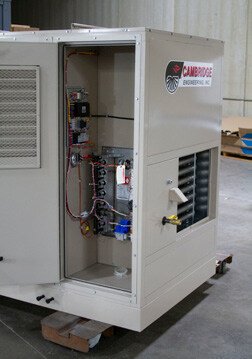 They use only a fraction of the energy of typical compressor-based cooling systems. Highly-efficient evaporative cooling systems can reduce energy use by 70%. (The actual savings will vary with the type of evaporative system and the climate.) For dry climates, where evaporative cooling can meet the entire load, they dramatically reduce peak-demand. When evaporative cooling is used with supplemental DX cooling it can reduce the DX cooling required. Moreover, since they use 100% outside air for cooling, the right evaporative cooling system can improve indoor air quality.